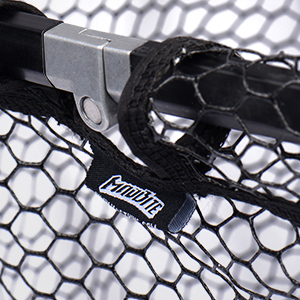 Patent Pending Folding Net – KastKing Madbite folding landing nets extend quickly for use and fold easily for storage in their own case. Save space and always have your net ready when needed. 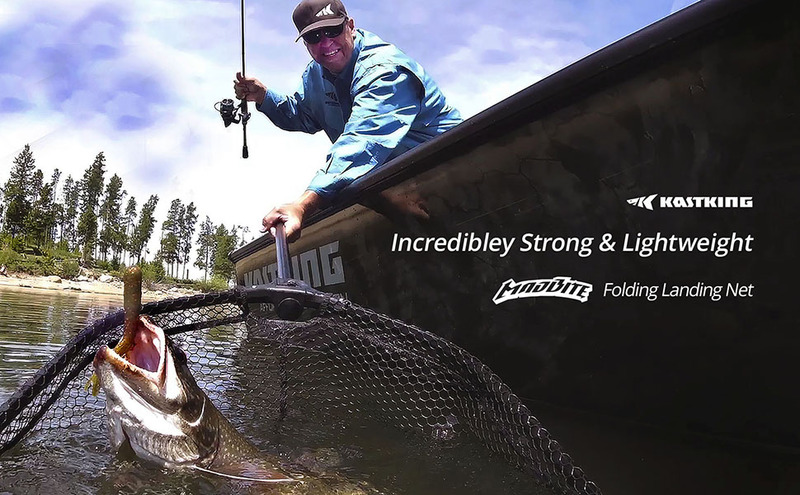 Lightweight, Aluminum Handle & Net Frame – High strength aluminum makes the net extremely light but the rigid, rectangular hoop frame makes it extremely strong for even the largest fish. The handle will extend to 45” or 76” depending on the model and is only 27” or 33” long when stored. Industrial Strength Graphite Components – The Madbite folding net utilizes incredibly strong, industrial grade graphite components such as the patented folding center yoke so there is no flex or weak points on this net. The front folding point is made of aluminum and features stainless steel screws. Available In Two Space Saving Sizes – There are two sizes available that will accommodate even the largest fresh or saltwater fish. The smaller net is 20” long x 16” wide x 20” deep. The larger net is 24” long x 20” wide X 24” deep. The folded size for storage is either 27” long x 8” wide or 33” long x 10” wide and they weigh just 1.4 or 2 lbs. 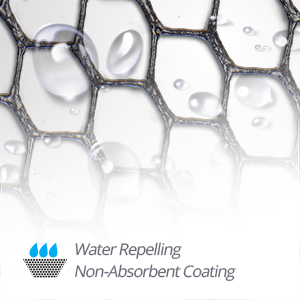 The rubber coated net material is snag proof and fish friendly. Measuring Device is Printed On The Handle – After you land your fish you can quickly get an accurate measurement of length using the handle which has been printed with a ruler. 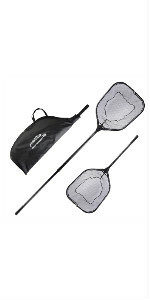 Madbite folding landing nets include a storage case. 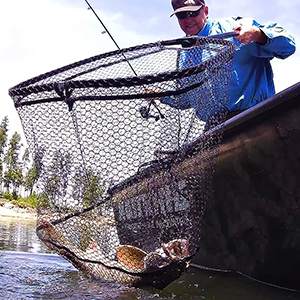 Landing nets are an important and necessary tool for all fishermen. However, because of their size and shape, they can be difficult to store and take up valuable space in your boat. 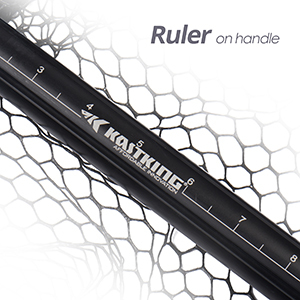 But now with the KastKing Madbite folding landing nets, you can always have a high quality, lightweight net close at hand and never in the way. 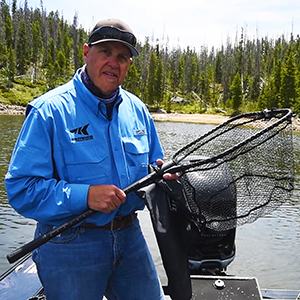 Madbite nets are available in two sizes and because of the patent pending design, will quickly fold for easy storage in any boat. The smallest net is 20” long x 16” wide and 20” deep with a handle that extends to a full 45” long. 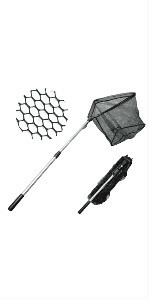 The larger net is 24” long x 20” wide and 24” deep with a handle that extends to 76” long. Easy storage is possible with the solid and secure, patented folding design made of industrial strength graphite combined with aluminum and stainless steel. This net is very light but will handle the biggest fresh and saltwater fish with ease and without flexing or weak points. This is the last net you’ll ever need and you’ll wonder why it has never been done before. The net material is made of a rubber coated, hook friendly material that not only keeps hooks from getting tangled but is also gentle on fish for effective releases. After landing your fish you can quickly get a total length measurement by using the ruler that has been printed on the handle. These nets weigh only 1.4 and 2 lbs and will store in their own storage case. Total storage size is only 27” long x 8” wide for the small net and 33” long x 10” wide for the larger model. 20L x 16W x 20 Deep 24L x 20W x 24 Deep 16" X 16" X 16" 20" X 20" X 20" 24" X 24" X 24"
This is a handy net and great product! I'm so happy I got this landing net. I've been ask many times where I got it! Its been great for wading in the river for walleye! I was unsure what kind of fishing net I was ordering because I needed to replace a heavy duty net for saltwater fishing. The description met every requirement that I have and exceeded my expectations. While light in weight, the net is quite sturdy and tough. 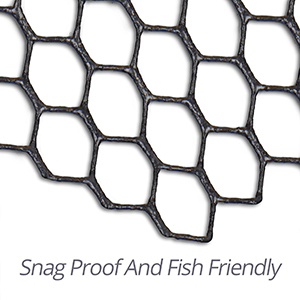 I would recommend the net to anyone who fishes regularly and wants reliability and durability. Good net, easily folds and collapses for storage. I love this thing!! Super compact for the size of net you get. Great ideas on the ruler in the handle. You can size the fish inside the net in THE WATER! That's the best thing for the fish. Rubber net looks good. Wish the net was a tick thicker with less holes but for the price this is Best Buy scenario. Even if it brakes or I lose it I'm not out a hundred or more $$$ if it happens. Love the net I purchased. I like the size and length of the net and especially like how small it folds up to pack or carry! It works perfect for all of my fishing needs.